Discussion in 'General Knife Discussion' started by BilboBaggins, Sep 12, 2018. While it is a framelock (R.I.L. ), Jason has added a piece of tungsten carbide into the lockbar that makes contact with the blade tang. He calls it the GTi lock. This appears to have a number of advantages over traditional framelocks. A few of these are moving the wear over time to the blade instead of the lockbar due to the high rockwell hardness of the tungsten, eliminating lock stick, and eliminating lock rock. Natlek and SpySmasher like this. No different than all the other steel inserts many other companies do on their frame locks. This ones just tungsten. Same thing, nothing new. Cool looking blade though! jeepin and Mo2 like this. I'm not sure that's correct. I had assumed (perhaps I'm wrong) that the steel lockbar inserts were there to prevent wear on the titanium lockbar (as titanium is softer than steel) and so that they could be replaced when worn out. I'm sure other, more knowledgable people here will correct me if I am wrong. In this case, the wear happens to the blade tang and not the insert or lockbar. Sweet looking knife my friend. That being said, I can't see the advantage of having the wear take place on the blade as opposed to lock-bar insert? This seems like a poorly thought out attempt to better/alter/innovate the steel lock-bar insert. In my opinion, it would be a hell of a lot easier to replace a standard insert than it would an entire blade....therefore, why? The very small amount of lock wear (which now moves to the hardened blade) that could occur with the GTI lock has proved to be beneficial. It does not have the same detrimental effects as the lock bar wearing. Slope force is the sideways force the lock experiences when the blade is pressed against the lock. Increasing the incline on the blade lock face, increases Slope force. Increasing Slope force decreases reliability as the greater force wants to push out the lock bar, resulting in lock failure or lock slip. When a lock bar wears, it wears to the same incline it is being pressed against. In this case the incline of the blade. Slope force now increases and reliability decreases. With the GTI lock, the opposite effect happens. The Tungsten Carbide wears the blade to a shallower incline, which decreases Slope force, resulting in more reliability as time goes by. Night Rider and SeppukuSamurai like this. Looks like he's successfully improved something that didn't need to be improved. The GTi lock wouldn't be a factor in my purchase, but it doesn't seem like a gimmick. I wasnt trying to knock it. Whatever it's intended actual purpose. 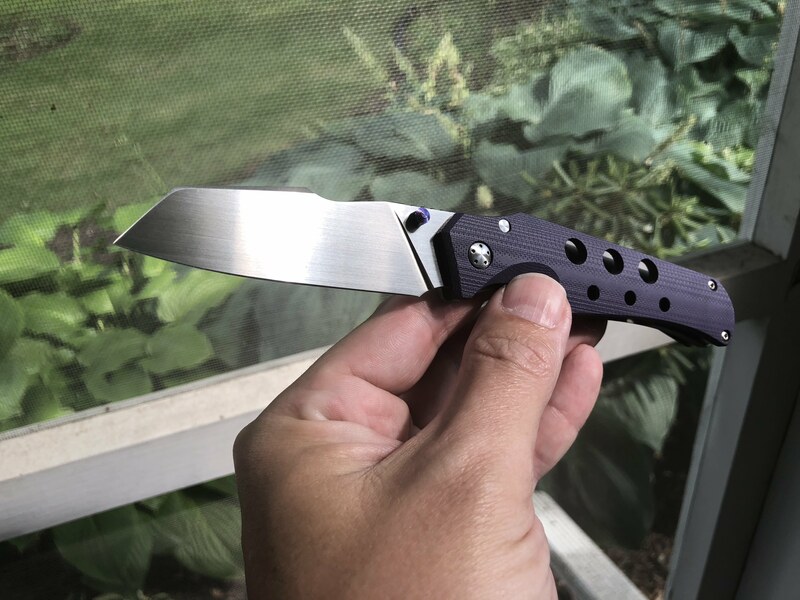 Wear the blade instead instead of the lockbar. Whatever. How many people have wore the lockbar down to the point it doesnt work? It's hardly a problem. Honestly we all, as knife people, get caught up with little things like that thinking it will be a problem but it RARELY is. It's mostly a sales gimmick. I like steel inserts only because of lock stick not because of fear of wear. If it helps wear great but like I said that would hardly ever be an issue. That being said that knife is killer looking and I'd buy it if I had the money. I'd say go for it but only if you like the knife. Dont buy it because of the tungsten. It's a bit like reinventing the wheel, but the new wheel has 2% improved performance. It's an improvement, sure, but the engineering feat to pull off such a marginal improvement is almost an exercise in futility. It's like coming up with a new titanium formula that has the same strength as the highest strength alloy, but 5% lower weight, but it's only being applied to knife locks. It's a cool achievement, but the difference is completely imperceptible. Thanks for everyone's replies. Also, I meant to @JasonG in the event he ever stops by bladeforums again. It's ehh. I would only get one if they changed to pb washers. BTW this is very old topic and you can already find a lot about it by Google, youtube and bladeforums. A solution in search of a problem. Very nice knife though. I'm actually more impressed with the looks, apparent strength/flexibility combo, and placement of the clip. I see. I can dig that. While likely an exercise in futility at this point, I love that makers are still attempting to improve, regardless of "if it works." There are only so many things one can do to a folding knife at this point to remain inventive. I'm pretty sure we've exhausted all of the "ooo, ahhh" innovations at this point. Well, expect for the Hawks, but you get what I'm saying. 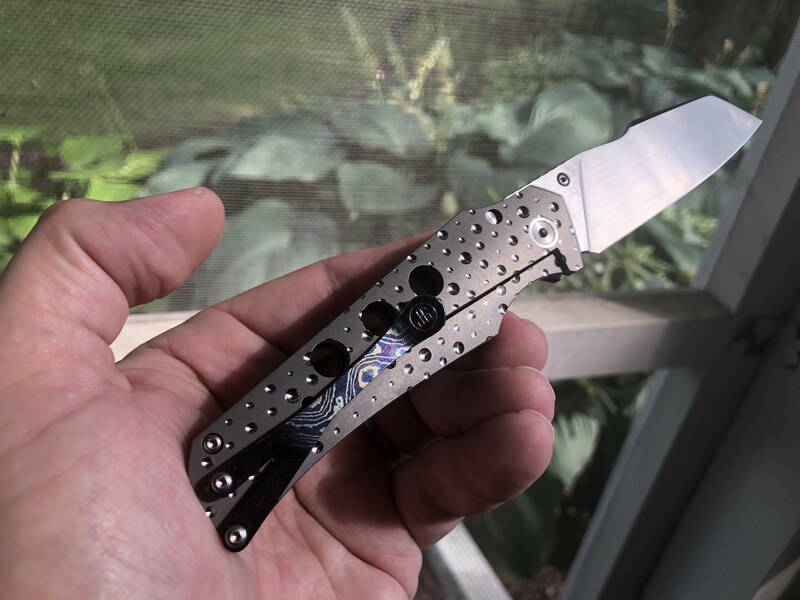 Jake Hoback is very close to releasing his Paraclete model with a new locking mechanism called the "270 lock" which is essentially a standard frame lock folder with the addition of a lockbar insert that extends into bladae of the knife for a totaly of 270 degrees of contact. I'm very aware of Jake's backround as a roll cage engineer and the exhaustive amount of testing he does on his products prior to release, ergo, I'm excited to see what's to come. I'm all about that small-but-measurable improvement in design. It's what makes me "ooh, ahh." I love (and try to support) makers who build with that ethos. What's tiresome (in the knife world) is the 10,000 variations of the same old thing. BilboBaggins, ArchVV and Glenn Goodlett like this. I don't really care for the look of the knife, but, I'm all about innovation and improvement, even if it is only 2% better, it may lead to something much larger. At least Jason I striving to make something better and improved. Good on him. austonh and SpySmasher like this. I will definitely do that. The 270 lock had not hit my radar. Much appreciated. Too bad the knife is ugly. But the lockup idea is cool. I wonder how well it will work. Charlie Mike and SpySmasher like this. I wish hoback and effenberk made knives that weren't so tactical and ugly. The engineering they have behind the knives are excellent, too bad it goes to waste on one style of knife. I think they make a slim kwaiback which could be sort of cool. Other than that I’m kind of over the whole titanium pocket brick thing. I don’t mind tactical knives per se but i just don’t understand the point of making the handles out of the thickest ti possible. For what? The knife will fail where the lockbar cutout is and the stock is thinnest. That is assuming the lock won’t just slip off under that force anyway. The only company I have seen doing something different with ti framelocks is Prometheus Design Werx (worx, w0rks, werccccs?) who rather than doing a standard lockbar cutout cut a semispherical hollow on the inside of the lockbar. I imagine this might distribute force better. NG VI and Mo2 like this. Pretty sure that there's a Hoback slipjoint in the works. I haven't seen any blueprints or anything but it should be pretty neat.